Before last week ended the ECB entered a new stage of its madness. The central bank is supposed to be the guardian of a monetary stability. The ECB does everything it can to destroy common currency. These kind of actions were found only done by corrupted to the bone banks in the third world countries. Today we observe a new standard. One that has long-term consequences and only few people seem to comprehend it. Coming back to what happened: on Thursday we heard an announcement of few changes. Three of them have a significant meaning. a) Lowering the deposit rate from -0,3% to -0,4%. Since introduction of NIRP (negative interest rate policy) commercial banks paid for a pleasure of depositing capital in the EBC account. After Thursday’s decision charges will increase. It is just a question of time when commercial banks will charge us in a similar fashion. On top of the fact that banks practically stopped paying anything to its depositors some time ago – soon they will charge for our pleasure of lending/depositing our money. b) Scale of QE increased from 60 to 80 billion EUR per month. This way the ECB is quicker at destroying currency than the FED during its last QE round. The European Central Bank will supply nearly 1 billion EUR per annum. The same amount the ECB earned back in 2006. That much. c) Increasing a level of bond buyouts. Previously the bank bought mainly a governmental debt. Now it will start buying commercial bonds too. Is your firm on the brink of going bust? No one wants to lend you any money (or buy your junk bonds)? The EBC has a perfect solution for you! Another camouflaged bail-out is being cooked up for commercial banks that are neck-deep in the US shale bond market. This is no coincidence that Draghi’s decision made junk bonds fund jump by 10%. Such radical steps show that the EBC acts in desperation. The question is whether Europe needs this kind of action? In 2011 investors got scared if the debt of PIIGS (Portugal, Italy, Ireland, Greece, Spain) would ever be repaid. Many countries had a problem of getting financing. The 10-year bonds of Portugal reached 14%. Bankruptcies that could cleanse the system were close, really close. Politicians afraid of losing common political currency project – the Euro – committed to saving it at all cost. Investors got the message – printing machines are ready. Either Germany let the ECB buy unwanted, bad European debts or it will be done behind the scenes by another central bank. The situation started to calm down. The ECB increased supply of euro. They bought time they needed. Whoever considered investing knew now that the central bank with limitless capital is an ultimate backer of deals. This made people buy bonds not for 4- 5% interest rate but to sell it after year or two with a higher price. If the central bank is buying debt this automatically creates surge in its demand. This in turn makes bond yield lower with higher price tags. Having a buyer – the EBC – prices of European bonds recorded their maximums (low yield). Below you can see a chart showing interest rates paid by Italian and Singaporean debt. Italy (blue) hasn’t got a balanced budget in 20 years. Debt-to-GDP - 132%. Singapore (red), for instance, does not have any net debt (is balanced within the budget). Country systematically produces a surplus of budget revenue and the GDP growth is at 6.5%. How is it possible that Singapore has to offer 2.2% per annum while bankrupted Italy can find creditors with only 1.3%? Logically you cannot explain it as the ECB disrupted the market so much that the fundamentals are hard to find. On the one hand, Singaporean bonds are valued by the market rules. On the other hand, interventions of the ECB made it so Italians can further their indebtedness at nearly no cost. There is much more evidence to prove a price manipulation in the European bond market. 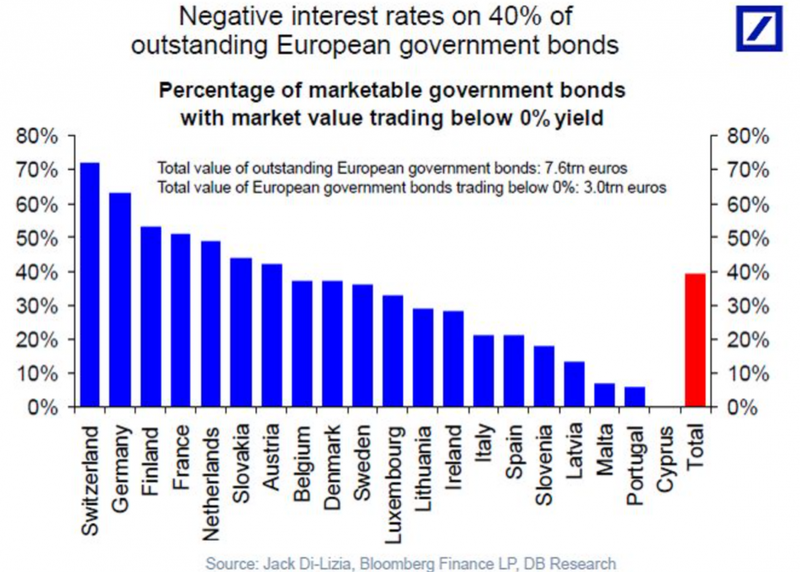 Today 40% of all government bonds in Europe have negative interest rates. It means that countries charge money for the “privilege” of crediting them. Let’s think about who in the right mind would buy this kind of bonds? Let’s say you are the investment fund manager. Would you invest in negative interest rate bonds – a guaranteed loss of your clients’ money? Of course, not! Your shareholders would replace you with someone more sensible. Bonds with negative interest rates are not the only problem. If the ECB loses control over interest rates and yield comes back to normal levels, price of your bonds would plummet by tens of percentage points. Considering the extreme option when the ECB does everything to supress bond’s low yield (high price) it should increase the supply of money and by creating inflation destroy the purchasing parity of the Euro. It doesn’t matter that they invest 1 million, after 10 years you could get circa 950 000 if the real value of money would lose 50%. In these circumstances, is there any logical reasoning behind investing in government bonds? Of course, not. A way better and safer decision is to hold capital in cash. Who then, buys bonds with negative rates? Definitely no one who aims at making a profit or store capital. It leaves central banks, affiliated institutions and a number of pension funds forced by legislation to do so. What is the goal of artificial undervaluation of European bonds with negative interest rates? The only reason behind such an action is the defence of the USD. Central banks never act on their own. Their actions are coordinated and engineered at the Bank of International Settlements (BIS) level. The BIS acts as a central bank for all central banks. A situation of any single country or region is of secondary importance. The true mission is to secure continuity in control at the international level. Anyways, central bank of one particular country helped institutions in other countries a number of times. In 2010 Ben Bernanke admitted in front of the US Congress that the Federal Reserve Bank helped many European banks with loans but he ‘didn’t remember’ banks nor the amounts loaned. Today it looks like Europe is paying its US debt. By keeping prices of bonds extremely high, the European bond market cannot compete with prices in the US. Investors take money over the Atlantic and buy American bonds slowing down the capital flight away from dollar . Chart below presents how much of the US debt was owned by China and Belgium, behind which we know also stood Chinese. Only during the last year China sold bonds worth 230 billion USD. This is not what you consider a small sum. Demand for dollars diminished also due to cheap oil and some countries are resigning of dollar as a trade-reserve currency. What is more, investors connected the dots of historically highest levels of dollar and the moment of first interest rates hike. Strengthening of over 20% of the US currency between June 2014 and mid-2015 already calculated the rate increase. Still there are few factors negatively affecting dollar and the BIS decided to intervene. Discouraging investors from investing in Europe is great for the FED which tries everything to keep the myth of a healthy US economy and strong USD alive. Additionally, the EBC is not the only one to lower interest rates into a negative area while the FED as the only central bank raised it by 0.25%. Right now banks of Switzerland, Japan, Denmark and Sweden also chose pathological monetary policy. In my opinion, keeping interest rates negative have to achieve one more important goal. The disposal of the debt accrued over the last 45 years. If we have negative interest rates with 4-8% inflation, the amount of debt in relation to GDP will start to drop. Obviously, this is not magic. Savings of the middle class are being devalued simultaneously with the debt. This way we promote borrowers at the expense of savers. People orchestrating the monetary system know that the hunger for debt at all levels – consumer, corporate and governmental – is sated and reached its limits. To reduce its levels you can either increase interest rates and risk mass bankruptcies or introduce a hidden inflation tax. The latter is desired more as population does not understand how inflation works. Mass bankruptcies will definitely incite a social unrest and may end up in losing control. An inflation debt reduction cycle has already started exemplified by the US market. In 2007 a total US debt reached 374% of GDP. Eight years later it dropped below 350%. Had consumers, corporations or government suddenly started paying back their obligations? No. The inflation rate was high enough to devalue the debt quicker than the accretion of interests. It is most likely that this is the solution which will be sold to us by central banks. Speaking of central banks, they officially admit that 2-2.5% CPI inflation is necessary. Depending on a country it translates into 7-8% of a real price increase. The difference stems from today’s method of calculating inflation that is distinct from the one that banks used in the past. The true goal is high real inflation, low official CPI inflation and zero interest rates. Still I am wondering: at some point central banks will have majority of a public debt. I am curious what would they ask for its restructuring at the last stage of the monetary reset. Maybe then we will see the rest of a national sovereignty gone in exchange for a fictional debt write-off? Will Swiss take creation of money back from commercial banks? Are we waiting for another ‘2008’? I totally agree with that one! But where capital will be running from this inflation? Any hints from smart money? I get what you are saying. Credit beats savings. Rational thinking doesn’t work now for markets when thinking about the future. Buying overvalued goods with overvalued money is the new normal. WTF...? – what if they will increase them by 12%? Or even 15%? Great article! I admire the interpretation, way beyond of what I could have guessed. With age I started to ask myself a question whether this everything is some sort of centrally planned manipulation or decentralized entropy that lefts everyone to improvise with ever worse consequences? Btw who are you Trader21? CEntral banks tease investors; that's their job - as there is nearly to zero fundamentals at play now. Only corporations buying their own stocks with printed money. Draghi and Yellen thinks probably it's a game, yeah? Until it isn't. Come on, let's play. That game can screw us all. Just saying. hahahah great video! Angela, it's her 100%! Guys do you know what is the leverage of central banks? I mean What was the Lehman's leverage when it was falling and what is leverage of fed or ECB? Oh and the leverage of our favourite bankrupt Lehman Brothers was 30:1. Geert Wilders said: “The cause of all this bloodshed is Islam. We need to de-Islamize the West. That is the only way to safeguard our lives and protect our freedom” I think he is right - but it would mean that all that merkel's, holland's and others must be kicked out too which is not possible now. Money is debt per se. Debt creates value distortion. Value distortion is the root cause of every crisis. You made brilliant point - fiat currency (paper money which is prone to inflation) is always just 'borrowed time' until there is a huge crisis of devaluation. Until people realise their money is worth less than paper. Value distortions (as a 'root') affect price. Price is the ultimate information we all need to evaluate our economic choices. When pricing mechanism is rigged (value distortion is not corrected through the market) then we have a huge problem. Crisis itself is a good thing. It makes asset allocation more efficient and clears the market from less efficient corners. 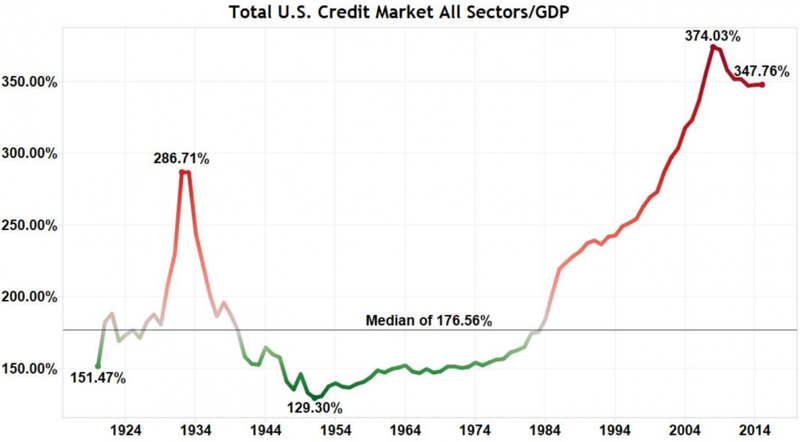 Real problem is when the crisis is triggered by people that do not want to see crisis anytime soon and create bubbles (past example: 2008 housing market bubble, derivatives, credit crunch; Fresh example: student debt in the US, shale bond market, Public debt in the European countries). This way the problem which economy could handle grows like a balloon and when it bursts... oh boy we better be educated enough to prevent drowning with the rest of the economy.